As first days of term after the summer holidays go, this one takes some beating. Whereas some 15-year-olds spent their first day back at school catching up with friends, sharing tales from their holidays or checking out their new timetable, Luke Matheson is a bit different. 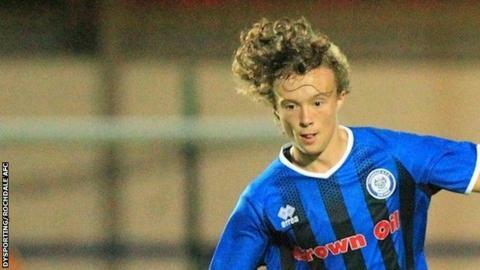 He returned to school on Tuesday but later that day, he became Rochdale's youngest first-team debutant, aged 15 years and 336 days. Not only that, but after coming on as a 13th minute substitute in their 2-1 Checkatrade Trophy win against local rivals Bury, the defender went on to pick up the man-of-the-match award too. "He was outstanding," said Rochdale manager Keith Hill. "He's been training with the first team whilst he's not been at school during the summer and I'm really pleased for him that he got his chance. They're special nights when that happens. "We know what he can do. It's not a leap of faith because we know he can do it, but is he cut out for the pressure of real men's football?" "The supporters were receptive to Luke, and the players are and were as well." The club's previous record holder was Dan Adshead, who also played against Bury in the same competition last season at the age of 16 years and 17 days. Reuben Noble-Lazarus is the youngest player to play in the Football League, making his debut for Barnsley aged 15 years and 45 days in September 2008. In November 2008, Gillingham striker Luke Freeman was 15 years and 233 days old when he became the youngest person to play in the FA Cup's first round. Andy Awford played a preliminary round match for Worcester City in 1987 aged 15 years and 88 days. Theo Walcott became the youngest player to play for England when he replaced Wayne Rooney against Hungary in May 2006, aged 17 years and 75 days old. The youngest international footballer is Lucas Knecht, who was 14 years and two days old when he made his debut for the Northern Marianas islands in a 9-0 loss to Guam in April 2007.